Items are useless if you don't know their ability. You need to make friends w/ vendors. What would you do to avoid being erased from the world? 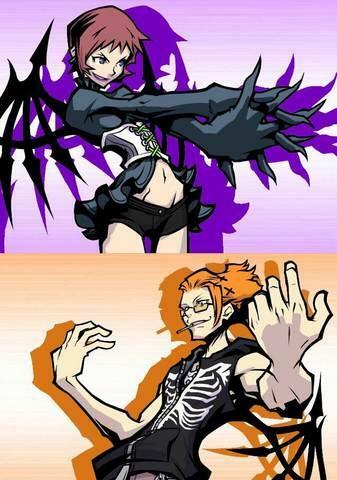 The World Ends with You, also known as It's a Wonderful Life is an action RPG game by Square-Enix. 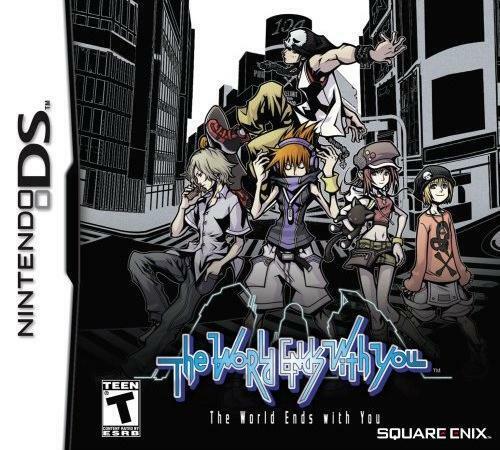 You play as the protagonist, Neku Sakuraba, a teenage boy with attitude in Japan who gets thrown into this game in the Underground (UG), a parallel dimension (kind of like the underworld). He unwillingly partners up with a girl named Shiki Misaki. She seems like your average teenage girl, who's really into fashion, and happy all the time...but she doesn't say much about herself or her past. 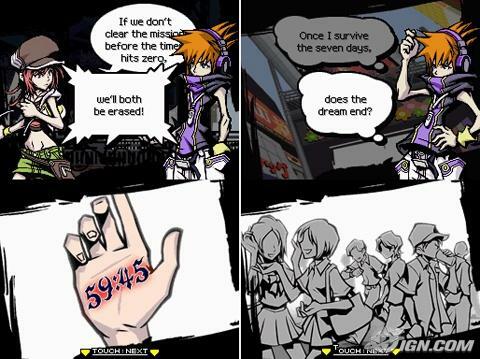 Neku has no choice but to partner up with her because without a partner, he will be erased. There are several other characters in the game, including other players, reapers, and the conductor (who controls the game). The game lasts seven days, and the players are sent text messages with missions, and they must complete them or else face erasure. 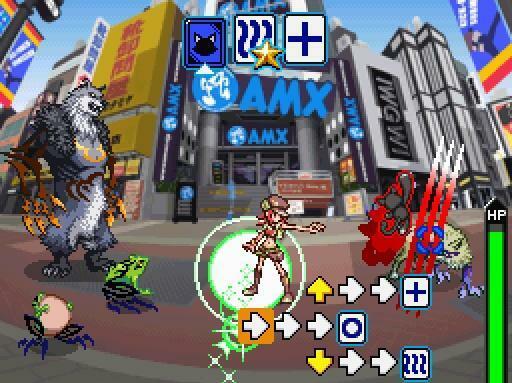 The game takes place in Shibuya, and the Underground (UG) overlaps with the real ground. The people from the real ground are all over the place, but you can't interact with them, but you can hear their thoughts. People with negative energy attract creatures called noise. Destroy the noise around them to help them get rid of their negativity. As the story unfolds, you learn more about the characters' past and how they ended up in the Underground. Get ready to do a lot of multi-tasking! You will need to use almost all the buttons on the DS, except the L and R button. 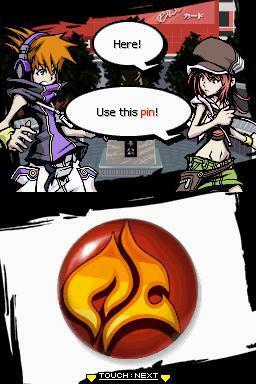 To move around, use the stylus and touch Neku, then drag the stylus to where you want to move him. Battles are split into two screens. Neku on the bottom screen, attacking and moving with the stylus only, and his partner is on the top screen. The directional buttons are used to attack on the top screen. I'll go into more detail about the controls in the Gameplay section. To seek out noise, you need to activate a pin which will allow you to see where they are. They range from small to large, obviously small noise are weaker, while large noise are stronger. You will see them floating around. Just tap them with the stylus to initiate a battle. You can string battles, for a total of 4 consecutive battles, but you'll need to quickly tap on the noise before the screen fades. 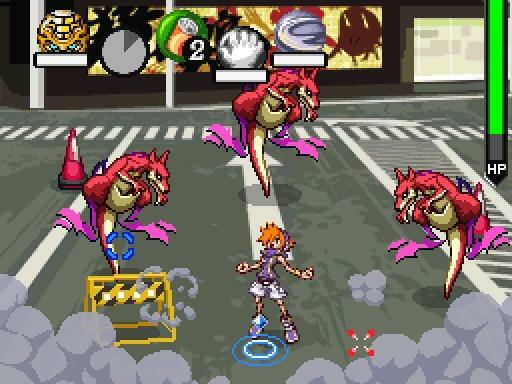 In battle mode, you move Neku the same way you usually do, and can drag the stylus faster to make him dash. Different attacks depend on which pins you equip. You will need to find, buy, or collect. There are several different attacks, such as slash, beams, throwing junk across the screen, fire, and etc. You can read the specs of each pin in the info section in the game. Here are some examples. Murasame: use the stylus and slash up vertically on an enemy any distance away from Neku and he'll go and slash them. Pyrokinesis: drag the stylus across an enemy to burn them. Neku's battles are on the bottom screen. On the top screen is Shiki's battle. You input her attack commands using the directional buttons. At the top of her screen are three cards faced down. You have to guess their order, of "o", "+" or 3 squiggly lines. If you guess them in the correct order you get more fusion points, and earn stars. 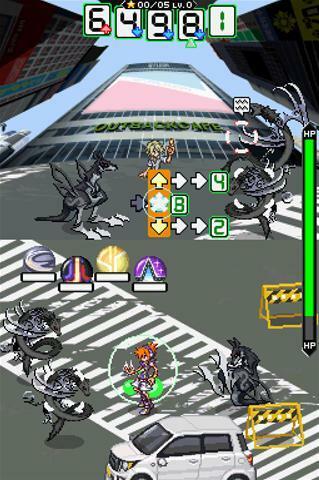 Stars are used for a combination attack by Shiki and Neku. When you attack with the directional buttons, you'll have to carefully look at the three combo options that are available, because each combo ends with a specific symbol. If the symbol you selected is not the first card, it will briefly flash where its correct position is so you will only need to guess where the other 2 symbols should go. 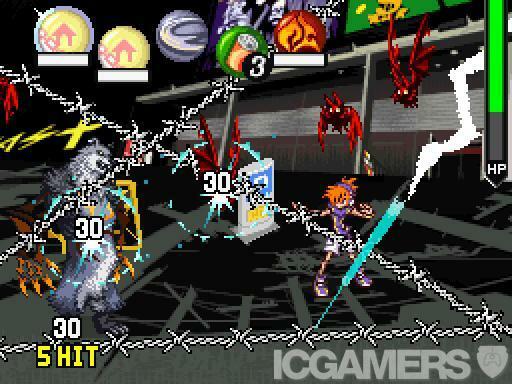 Oh yeah, don't forget about Neku on the bottom screen. If you stop entering commands for Shiki, she will switch to auto mode, so you can take a breather. The game looks very anime-ish, and more stylish than the other 2D platform or RPG games. The background looks very dull, but the characters are vibrant and colorful. This game is developed by the same team who did Kingdom Hearts and it really shows in the character designs. The music in this game is amazing. It has rock, hip hop, J-pop, and electronic music. It certainly fits the mood of the game. It's a little funky at first but it grows on you. This game also features vocal soundtracks, and trust me, they will get stuck in your head. There are songs in both Japanese and English. There are also voiceovers, but I can't remember if it's throughout the game or just the intro. This game becomes very addictive. It's very pleasant to look at, challenging to play, and if you're like me and like to collect and upgrade all the pins, you will be spending a LOT of time on this game. Battles are not turn based, so you can get as creative as you want. Plus, the card guessing/matching will make sure you're paying attention. Think of it as a memory game. If not for the gameplay, I would still revisit this game purely for the music.